This ceiling mural with trompe l'oeil architecture was commissioned to be a mirror image of the carpet designed for the room. The completed mural was 5 by 14 metres, pre-painted on canvas and stuck to the ceiling using a traditional process called marouflage. 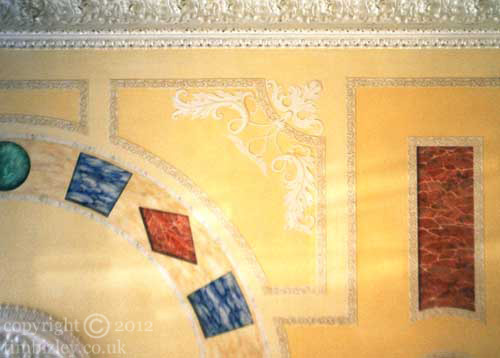 Painted architecture and strap-work mouldings surround inset specimen faux marble sections. The whole design is set off with Acanthus leaves with a specialist decoration stippling paint effect providing the overall colour. The ornate Queen Anne cornicing and ceiling rose were later toned down to better link to the overall colours used. Trompe l'oeil painted architecture is a useful method of adding relief elements to an interior for general embellishment or to tie in with extant design elements. Commission for interior designer. London. U.K.